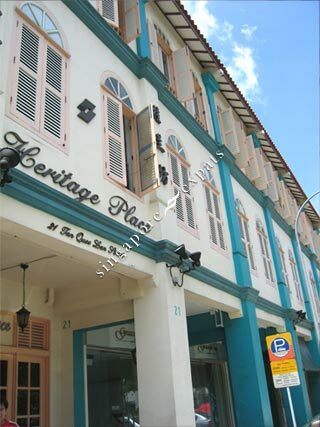 Heritage Place - Historical shophouse located at Tan Quee Lan Street off North Bridge Road and Beach Road. This whole development is originally built in the early nineteenth century and is later conserved and upgraded. Each apartment in the shop house has timber flooring, modern kitchen and bathrooms. There is a small balcony facing the back street. Apartments are small but cosy with a touch of old world charm. Heritage Place is a stone's throw away from Parco Bugis Junction and the Bugis MRT Station. Since it is located in the Central Business District, commuting to work s extremely convenient. There are also plenty of shops, restaurants, pubs along Liang Seah Street which is behind Heritage Place. Amenities like supermarkets, cinema, departmental stores can be found in Bugis Junction too. The National Library is also within short walking distance. Conservation shop houses in this district are very popular with expatriates. Beside Heritage Place, Liang Seah Court and Liang Seah Place are other alternatives.